Bitcoin prices were volatile in overnight trading. The price of the virtual currency bitcoin, already volatile in recent weeks, went through wild swings in overnight trading Tuesday and Wednesday. According to prices quoted on Mt.Gox, the main trading exchange for bitcoins, the value of one bitcoin ricocheted from $106 to as high as $147, then back down to $125, then to $141. They were trading around $139 per bitcoin in afternoon trading Wednesday. Two weeks ago, a bitcoin was worth only $47. 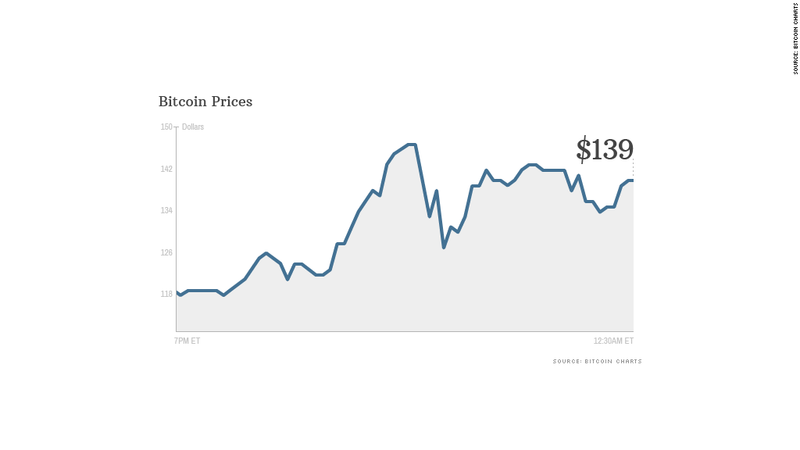 When Mt.Gox started tracking prices in mid-2010 the price stood at only 5 cents per bitcoin. Investors have been pouring into bitcoins and gold in recent weeks, as authorities in Cyprus imposed a tax on top bank depositors and placed limits on bank withdrawals in order to pay for a European bailout of the banking system there. Bitcoin is a four-year-old digital currency developed by a hacker who still remains anonymous. It's designed to allow worldwide payments with extremely low processing costs. Societe Generale currency analyst Sebastien Galy said the market for bitcoins is likely to remain volatile. New investors are flooding into the market to try to cash in on the wild price swings. He said that as more people purchase and trade bitcoins, the currency's supply is supposed to increase. But some traders are buying and holding the bitcoins in an effort to limit supply and drive up the prices. "It's a fascinating, very small niche market," Galy said. "There's a limited amount of supply that's available, and it creates waves of upswings. It's a bit like the gold rush in California. Everyone is rushing into and it and everyone is over-excited. But that makes it very risky. It should come with significant warnings of buyer beware."